In 1898 the United States won the Spanish-Cuban-American war and took control of Puerto Rico, Guam, and the Philippines. That same year, it also annexed the Hawaiian islands. 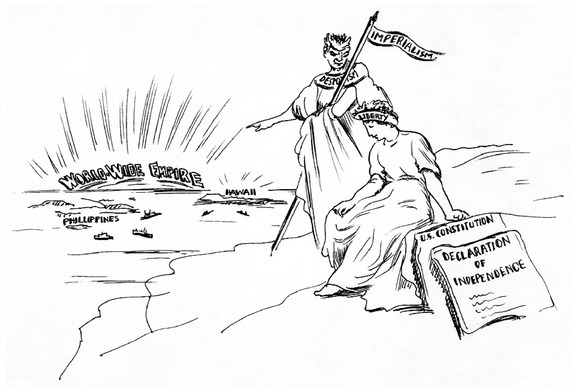 This 1899 cartoon reflects the belief held by many anti-imperialists that this expansion of U.S. power did not fit the nation’s democratic ideals. Source | [Unknown], American Sentinel, reprinted in Literary Digest, 1 April 1899. Cite This document | Unknown, “"The New Temptation on the Mount",” HERB: Resources for Teachers, accessed April 23, 2019, https://herb.ashp.cuny.edu/items/show/627.